Since I happened to have this bounty of homemade ricotta cheese (pats self on back), I was anxious to put it to work in a fabulous recipe. And what better way to showcase it than in these delicious, fall inspired ravioli. For me, making ravioli is like making lasagna. When I make them, I spend an afternoon assembling as many as I possibly can (within my budget and time constraints) and freeze them to be used as a quick, delicious, homemade meal later on down the road. It takes a little bit more time now, but I save myself a great deal of time and energy in the future, which I am always extremely grateful for, when life becomes a little too hectic to spend much time in the kitchen. I begin by making the filling by combing one cup of homemade ricotta cheese, one cup of canned pureed pumpkin, a half a cup of grated Parmesan cheese, one large garlic clove (grated on my microplane zester), a third of a cup of toasted pine nuts, one egg yolk, a small dash of salt, a pinch of cayenne pepper, some freshly ground black pepper, and a dash of freshly grated nutmeg. I then taste the filling and make any necessary adjustments. Next, I make an assembly line on my cutting board. I line square won ton wrappers up six at a time, brush the entire surface with water, place a a small dollop of the pumpkin filling (about a rounded teaspoon’s worth) in the center of each, then place another won ton wrapper over the tops. I gently work out any air bubbles, and press around the filling, to ensure a good seal. I then cut each ravioli out using a medium, fluted biscuit cutter, and crimp each along its outside edge with tines of a fork. I repeat this process until I run out of filling.Once you get into the rhythm of it, it really doesn’t take that long to assemble all of them. To freeze the ravioli, I place them in a single layer on a parchment lined baking sheet and freeze, uncovered, until they are frozen solid, and then transfer them to a zip lock freezer bag. For those that I wish to serve right away, I gently place them in a pot of boiling, salted water, and boil for about two minutes or until they float (you will want to add a minute or two to your cooking time when you are preparing them from frozen). Meanwhile, in a small sauce pan I melt one stick of butter over medium low heat, and allow the butter to brown. When it is fragrant and nicely golden brown I toss in a small handful of fresh sage leaves (either whole or coarsely chopped depending on your presentation preference), and allow the sage to sizzle away in the butter for a minute or so before adding the cooked ravioli. The ravioli are rich and unbelievably creamy with the homemade ricotta cheese. 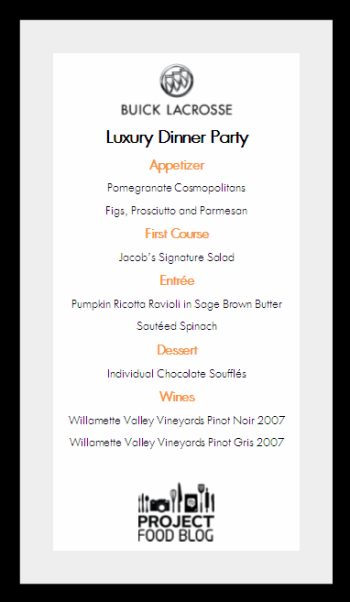 The toasted pine nuts, and salty Parmesan really round out the subtle pumpkin flavor, and it all beautifully harmonizes with the nutty brown butter and sage. All of the fabulous flavors of fall on a plate. 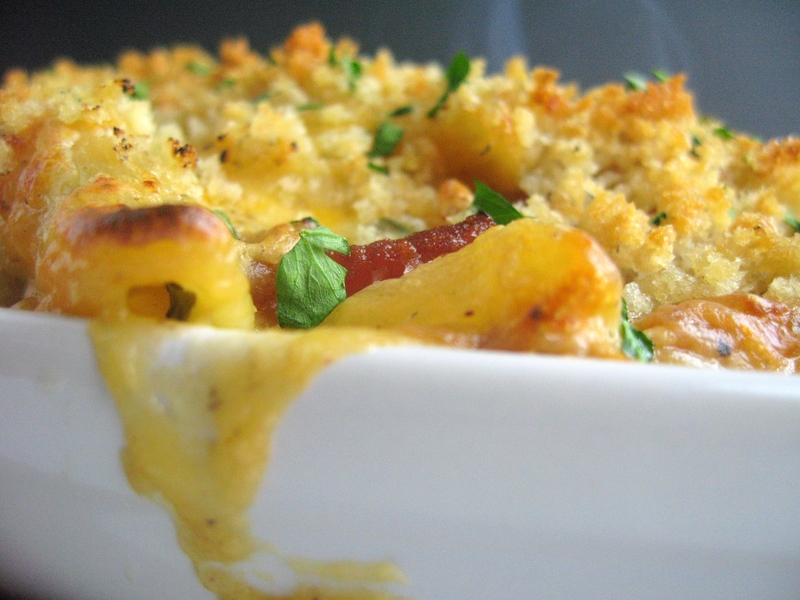 This is elegant comfort food at its best. Simple to prepare in advance, and extremely quick to bring together before serving it is also perfect for entertaining. Enjoy! I heard about this idea of making gnocchi with ricotta cheese instead of potatoes or rice some time ago, and have been eager to try it ever since. I found myself this morning with extra ricotta cheese, and thought that the time had finally come to do so. I combined one stick of melted butter with sixteen ounces of ricotta cheese (homemade ricotta cheese really is better… and it’s easy to make…seriously, it will ruin you for life), a half a cup of Parmesan, one egg, a little salt, a dash of freshly grated nutmeg, and a pinch of cayenne pepper. I then added just enough flour (read: as little flour as possible) to make a soft dough that is no longer sticky, working it as little as possible. I cut the dough into fourths, which I then gently rolled into long ropes, cut them into half inch segments, and rolled each down the back of the tines of a fork, creating those classic gnocchi ridges. I boiled them in gently simmering, salted water for about three minutes. Meanwhile, I melted a stick of butter in a sauce pan and cooked it over medium heat. When it was nutty, fragrant, and a nice chestnut brown, I added a tablespoon or so of fresh thyme leaves (I love the sound as the leaves pop and crackle in the hot butter). I then combined the sauce with the cooked gnocchi, and finished it off with a sprinkling of Parmesan cheese. These gnocchi are rich and cheesy. Not quite as feather light as some others I have made, but a great pairing with the nutty browned butter and thyme. Pour yourself a glass of Chianti, close your eyes, and you would swear that you were in Italy. Enjoy! 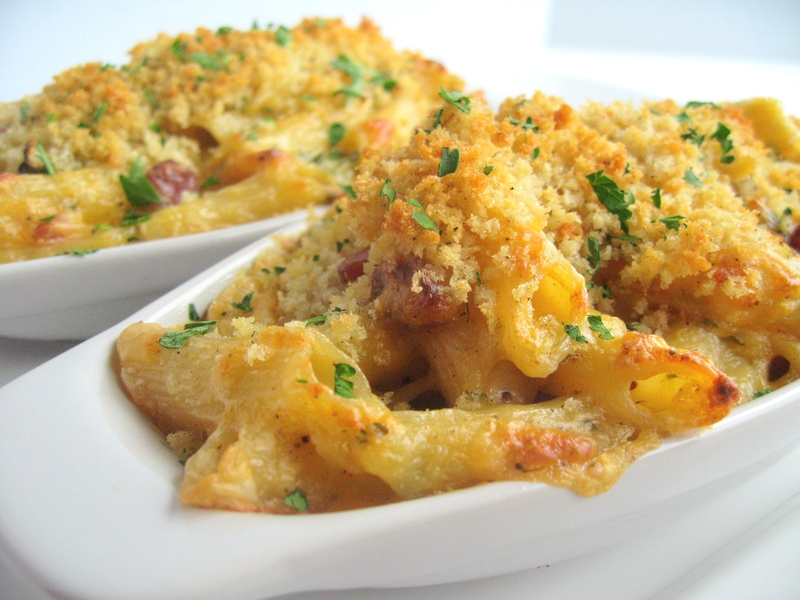 I think we all have our own macaroni and cheese recipes that we come back to time and time again. 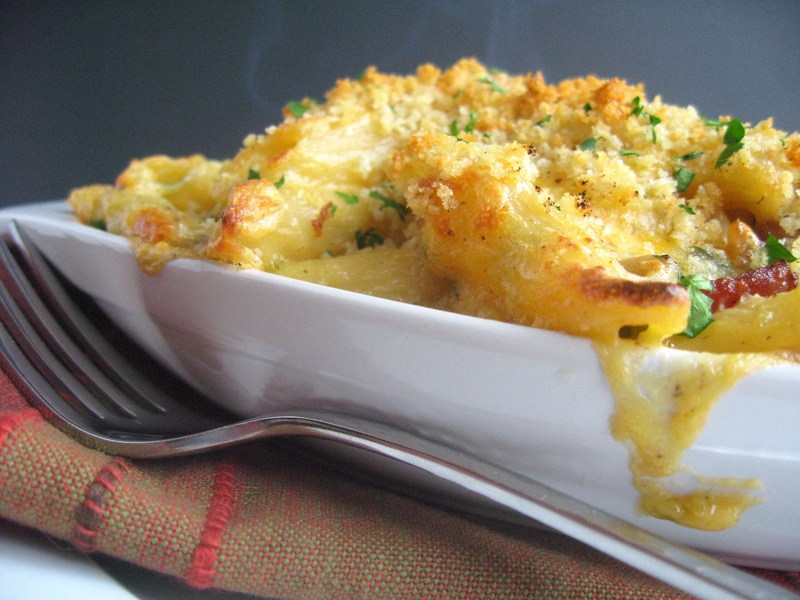 I, myself, always start by making a béchamel sauce, and melting in my favorite cheeses. I always add nutmeg, salt, freshly ground black pepper, and a pinch of cayenne. Depending on my mood, however, I might also add a teaspoon or so of Dijon mustard (which adds a nice background acidic note that is really lovely), a tablespoon or so of pimentón (since I apparently cannot cook anything without it), any number of different fresh herbs, and really, whatever else sounds good to me at the time. Here I took slightly undercooked penne pasta and tossed it in the thick and creamy cheese sauce (made with extra sharp cheddar, Gruyère, and a little bit of Gorgonzola, for that amazingly delicious, complex, picante flavor). 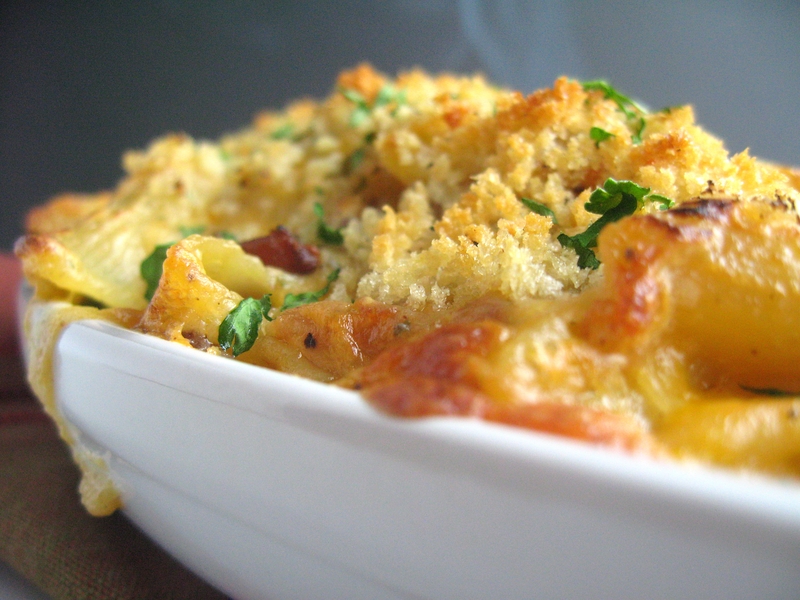 I then added a handful of chopped fresh basil, some cooked bacon (the fat from which I used to make the base of the béchamel), I portioned the pasta into individual gratin dishes, and topped them off with some fresh bread crumbs and a few dots of butter (to ensure browning). 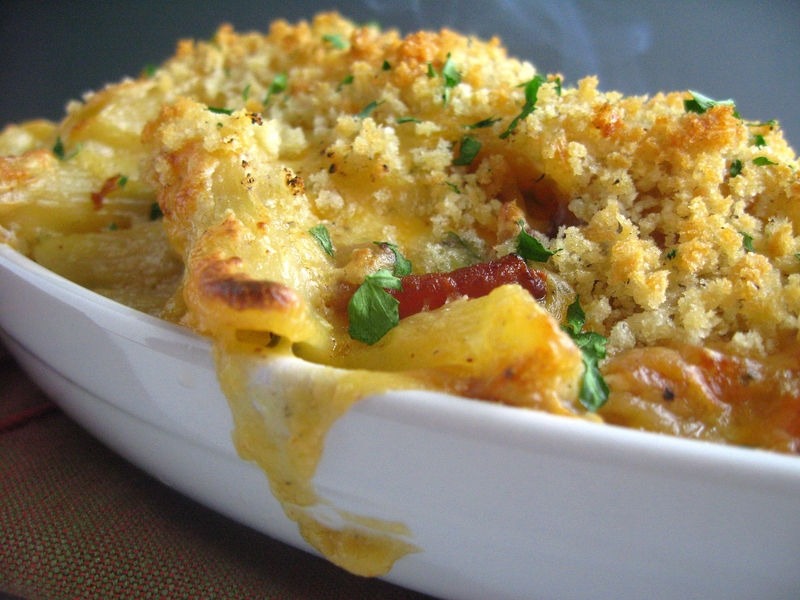 This is really macaroni and cheese dressed up for company. Serve it with a simple green salad, and you have the makings of a perfect dinner party. Enjoy!